The round pegs in the square holes. The ones who see things differently. They’re not fond of rules, and they have no respect for the status quo. You can quote them, disagree with them, glorify or vilify them. About the only thing you can’t do is ignore them because they change things. They push the human race forward. And while some may see them as the crazy ones, we see genius. (it did), but because it reminds me that we need to be a little (or a lot) crazy to make a difference in the world. 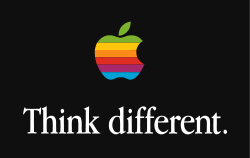 What does “think different” mean to you? I use it as my reason to blog, write books, perform magic, speak to strangers and generally be silly and in awe of the miraculous world around me. On my best days I do these things without guilt or apology because I believe that’s what the Einsteins, Campbells, Gandhis, and Jobss of the world did. My email signature includes my absurdly audacious promise to “Change the world, one mind at a time.” Ballsy? You bet? Irreverent? Maybe. Necessary? Yes (for me, anyway). I get up every day with the intention of delivering on that promise. When was the last time you did something that was courageous, inspiring and a little crazy? Did it make a difference? Even if our actions didn’t knock the world off its axis, isn’t it important that we tried, and that we’ll try again? Here’s to the crazy ones.